How does ritual manifest itself in today’s society? Twelve artists explore this question in an experimental show Contemporary Art + Ritual. Encompassing sound, light, word via dust, wood, thread and more the show reveals ritual to be an expression of human life that is undergoing a process of constant reinvention. The Crypt’s atmospheric brick vaulted corridors will take the viewer on a journey through healing, wishing, weaving, walking, cleaning, carving, folding, painting. A giant gold chain fashioned from bread snakes across the floor of a dark vault, two spectral life-sized figures made of dust hang from the ceiling, a ghostly woman conjures magpies from nowhere. In one chamber metal boxes emit birdsong reminding us of the passage of daily life, and in another hundreds of wishes are beamed out into the darkness. 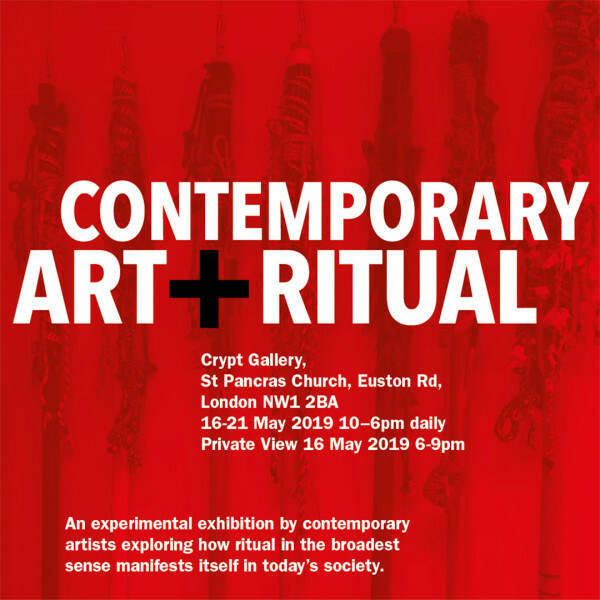 Communal ritual is explored in the performative walks of textile and performance artist Elspeth Penfold and axe on wood work sculptor James S. Bond whose work aims to reconnect with a time ‘when all humans were present to the life of trees. Zara Carpenter takes Polaroid of her body are a form of ritualistic behaviour arising from a diagnosis of OCD. For painter Jane Walker and multi-media artist Sally Tyrie making work is itself a ritualistic activity, while Hannah Stageman and Blandine Martin transform everyday rituals into art.